The Oculus DK2 is a remarkable VR headset, producing a remarkably wide field of view with very inexpensive single element optics. 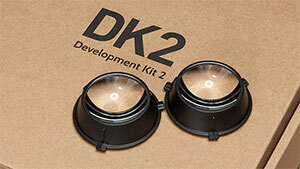 VRtifacts was curious about the characteristics of the Oculus DK2 lens: what size, what material, and what focal length? The lenses themselves have quite a bit of chromatic aberration, giving the impression that they are very low cost simple lenses. The diameter is 41mm and focal length (of the “B” lens) is approximately 45mm. This is a fairly high degree of magnification which produces significant distortion and chromatic aberration (color fringing near the lens periphery.) Oculus takes full advantage of modern day graphics cards using OpenGL to pre-distort opposite to the lens distortion, and to individually distort the red, green, and blue channels to (imperfectly) correct for chromatic aberration. The color fringing correction is imperfect because the lens bends different frequency light by different amounts. The process in the lens is a continuous curve across the color spectrum, while the graphics card only corrects at 3 discrete frequencies corresponding to red, green, and blue… essentially a step function. However, since the display emits moderately narrow bands red, green and blue, we perceive good chromatic aberration correction. AMOLEDs (DK2 uses a Samsung Galaxy Note 3 Full HD Super AMOLED) use organic electroluminescent materials which do not emit single frequency red, green, and blue colors. Instead they emit a range of light frequencies consisting of a spectral curve for each color primary. 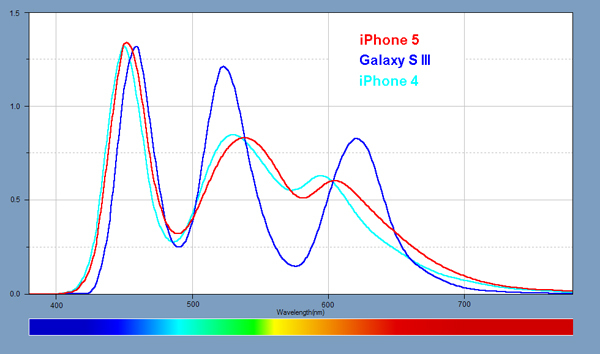 AMOLED spectral curves are narrower than produced by IPS LCDs (used in Apple retina displays), but the width of the frequency range for each primary is not a single frequency. The Oculus chromatic aberration correction technique only works perfectly at the exact center frequencies of each (RGB) emission curve. Since the AMOLED emissions spread around these ideal Oculus corrected center frequencies, chromatic fringing can not be totally eliminated by the Oculus technique. What’s The Oculus Lens Made Of? 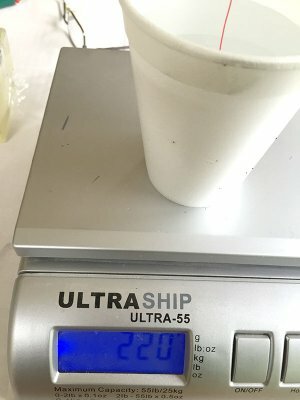 The easiest way to determine specific gravity is to use a cup of water as a reference weight, measured with and without the lens dunked into the water (but not touching the container.) A small digital scale is used. We also weigh the lens alone. The specific gravity is simply the lens weight divided by the change in water cup weight when the lens is dunked. 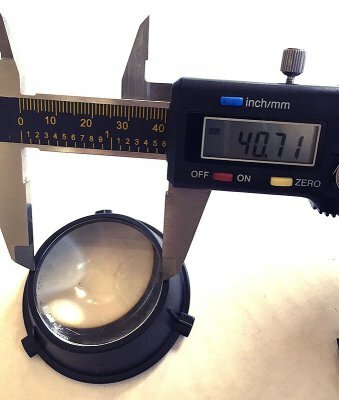 Our lens is actually 16.7 grams, although the scale doesn’t have the tenth’s digit. The cup of water is 206 grams, and the cup of water with the lens dunked is 220 grams, a 14 gram difference. Thus the specific gravity of the lens is 16.7 divided by 14 which is 1.19. Looks like we’ve got acrylic, but the specific gravity is only about 2% off that of polycarbonate, which would be 1.21. A final test is in order. Heating the plastic will reveal whether it’s polycarbonate or acrylic. Acrylic bubbles but does not emit much smoke, whereas polycarbonate chars and produces dark smoke. The video below shows what happens. AND…. It’s acrylic, the least expensive material! In quantity from China they’re about 25 cents each.